A 37-year-old single mom of three, Jessica White, MD, balances the demands of being a parent, medical practitioner, and fitness advocate with grace and ease. Balancing life, work, family, and fitness is possible, so long as you're willing to be kind and patient with yourself. Unfortunately, many people struggle to achieve this balancing act. And no wonder: Each of those components can become all-consuming at times. If something has to give way, too often it's fitness. That's unfortunate, because fitness can fuel those other life aspects, energizing the day and expanding one's work capacity. 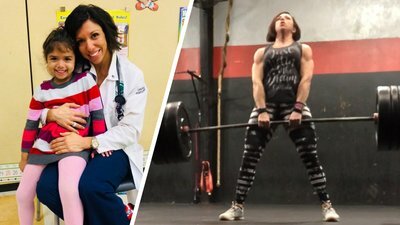 You'd be hard-pressed to find someone busier than Jessica White, M.D., who works as a doctor and does figure competitions in her spare time. She also raises three kids as a single parent. We wanted to find out how Dr. White manages this juggling act—and her secrets will both surprise and inspire you. White's work schedule is not your typical 9-to-5—no surprise there. After she leaves her house on Monday morning, she heads to a 5 a.m. CrossFit class and then goes to the hospital where she works as an inpatient site medical director. She works for 48 hours straight, doing four sets of 12-hour shifts, back to back, banging out her whole work week from Monday morning to Wednesday morning. She even sleeps in the hospital, while her patients are sleeping. After 48 hours at the hospital, she begins her 90-minute commute home—only to stop at the gym for her Wednesday morning CrossFit session. She loves tracking her progress and setting new PRs, as well as the sense of community CrossFit engenders. In fact, she'll hit that 5 a.m. class again for each of the next four days. Occasionally she adds a second workout at home on cardio equipment housed in her basement, where her kids like to hang with her. She's driven, without question, but at the same time, she seeks balance. Her oldest son, a 12-year-old, likes to tell her, "You don't have to have muscles—you can just be a regular mom." He isn't a fan of the prep work leading up to figure competitions, when White isn't able to eat what the rest of the family enjoys. But, she tries to engage her children in the training process and keep it fun for them by doing family runs and bike outings together. White entered her first figure competition in October 2016 at the Brooklyn Grand Prix. She finished fourth in the novice and open categories, and second in the master's class for competitors 35 and over. She hit the stage for a second time shortly afterward, at the Gold's Classic. This time she ran the table, finishing first in all three of the aforementioned classes. She competed for a third time in October 2017, at the NPC East Coast Championships, where she placed first in open and second in the master's class. A major challenge for White became balancing her interest in figure with her love of CrossFit—especially when her coach directed her to adopt a more traditional approach to training during her contest preparation. There were exceptions. For example, her coach allowed the longer endurance days full of rows, double-unders, and runs. However, White steered clear of lifts like cleans and snatches in favor of more traditional bodybuilding moves. Today, since she's not currently in preparation for a bodybuilding show, she's hitting the 5 a.m. CrossFit classes again. Her alarm goes off at 4 a.m., yet she's often up before it buzzes, excited for the workout. That's how she knows that CrossFit is her jam. Recently, White attended a "medical doctor only" Level 1 CrossFit certification course. Her goal is to use her new knowledge to help her patients achieve their health and fitness goals. "It's been gratifying to watch other people have success at CrossFit," she says. "To see someone do their first pull-up, and make significant improvement in their overall health, brings tears to my eyes." Sticking to a workout can be difficult, but for White, it's well worth it. Exercise sharpens her mentally and physically, allowing her to be a better mom and a better doctor. When she skips a workout, she doesn't feel as good, and consequently, doesn't give as much to the people she serves, whether that's her kids, her patients, or herself. Additionally, she's found that when she's working out only for aesthetic reasons, there's typically not a deep enough drive to stick with her fitness long term and make it a lifestyle. She's no different from others in that regard. When she brings meaning and true purpose to her workouts, she extracts meaning and true purpose from them in return. Firmly out of her competition cycle, she's currently taking glutamine in the mornings and evenings, and BCAAs during workouts that are really intense. Post-workout, she has a protein shake. She eats healthy and clean, consuming mostly green vegetables and protein from predominantly chicken, eggs, and fish. She does eat some red meat and dairy, and her carbs, including sugar, are essentially from vegetables and fruit. Nuts and seeds are also on the menu, and she eats a ton of peanut butter, which she says, tongue firmly in cheek, should be its own food group. As a medical doctor and Level 1 certified CrossFit trainer, White hears a lot of people say, "I'm not healthy enough" and yet they put off going to the gym because they don't feel good about themselves. They make deals with themselves like, "I will go when I look better," or "I'll do CrossFit when I'm stronger." It frustrates her because nobody ever wants to go when they're weak, she says—not at first. And she knows this firsthand, too. When she started with CrossFit, she couldn't do a single pull-up. Everyone has to figure out for themselves how to get over that hump, how to get motivated, she says. And, once you get going, you will see and feel the benefits almost immediately: an increase in energy, a boost in mood and confidence, better sleep, better body composition, decrease in age-related loss of muscle mass, decrease in depression and stress levels, decrease in age-related cognitive decline, and a reduced risk of developing osteoporosis. So no matter how busy you are, or think you are, start working out, even if it means setting your alarm for 4 a.m. It's worth the effort. Take it from a doctor.